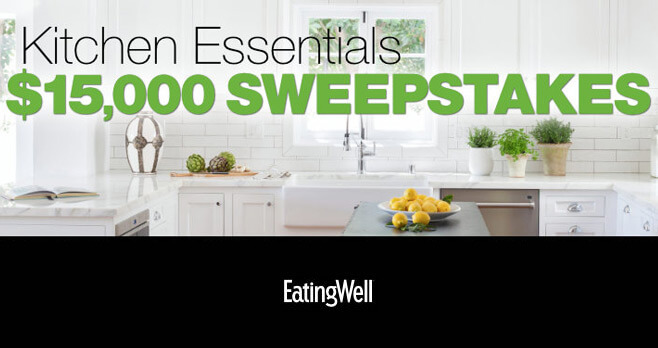 Win $15,000 Worth Of Kitchen Essentials From EatingWell! Want to upgrade your healthy cooking skills and prepare healthier recipes? Enter the EatingWell $15,000 Sweepstakes at eatingwell.com/15k now through August 11, 2017 and you could win kitchen essentials from EatingWell.com. One lucky grand prize winner will receive $15,000 cash, awarded in the form of a check. The winner will be announced on September 11, 2017. Visit the Sweepstakes Web Page during the Sweepstakes Period. Complete the required fields as indicated on the website. That’s it! You will automatically receive one Sweepstakes Entry for each entry form you submit during the Promotion Period. Please note that by entering the Sweepstakes, you will also register at www.eatingwell.com if you are not already registered. Approximate Retail Value of the grand prize is $15,000. For complete details, including Official Rules, visit meredith.promo.eprize.com/eatingwell15k. i try hard to eat more fruits and drink more water.